Looking to take on the likes of the Samsung Galaxy S II and the HTC Sensation XE Motorola's latest Android powerhouse has reinvigorated the Razr brand with a series of high-end specs and sleek design characteristics combining to produce a premium device that impresses on most fronts. Despite being officially unveiled the same day as Google's latest 4.0 version of the Android OS, Ice Cream Sandwich, the Razr somewhat disappointingly boasts Android 2.3.5 Gingerbread with the manufacturer's new UI skin bringing the now repetitive operating system to life. Implementing a number of subtle but bespoke design features, Motorola has crafted the Razr with a unique form that stands out from the crowd of largely lifeless slabs of black plastic that make up the smartphone market. Lining up at just 7.1mm thick at its narrowest point and a mere 127grams in weight the RAZR looks sleek and compact yet manages to feel obtrusive and uncomfortable in the hand. Whilst the flat Kevlar back panel makes the Razr reassuringly sturdy with no flex when put under intense pressure, its rigid design is in no way ergonomic giving the device a boxy feel, one which no matter how you position your fingers seems determined to remain awkwardly positioned and feeling clumsy. Boasting a bevy of premium specs from a zippy 1.2GHz dual-core processor to a vibrant 4.3-inch Super AMOLED Plus display the RAZR's touted 12.5 hour estimated talktime battery life runs true with the battery's red zone seeming to eek out the final dregs of power before finally giving up. Back to the stunning 4.3-inch display and whilst the Super AMOLED Plus offering supplies hugely impressive output with crisp images and sharp, fluid video playback this expansive offering is somehow made to feel lost within the device as a result of its ridiculously large bezel. A nice feature in making the handset life proof and surely capable of withstanding the now predominantly 24 month contract runs, the handset's splash proof nano tech coating was tested repeatedly with a simple wipe on the jeans all that is needed to remove the repelled liquid. Boasting a number of small yet impressive features from the power saving night mode to the auto locking pocket sensor, the RAZR is a handset that is a joy to use. At times sluggish to exit applications and return to the home screen it is otherwise predominantly flawless in terms of performance. A sleek UI and smooth menu and home screen transitions Motorola has provided a very fluid experience. With an 8-megapixel camera on the rear snaps are of a reasonably impressive quality with the usually rapid shutter speed slowing considerably when in low light situations or when using the feature with the flash turned on. 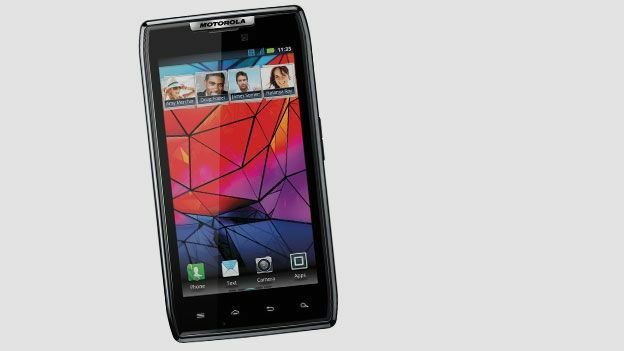 A new benchmark for the Motorola brand, the Razr is an impressive, high-end, well functioning handset but one that is not quite a market leader or on par with the likes of the iPhone 4S and Samsung Galaxy S II. In a less than appealing way Moto has managed to make a large handset feel big beyond its size with what should be a dominant display feeling beautiful but lost.